Even 45 years after its release it is difficult to know what to make of Stanley Kubrick’s 2001. Is it, as polls such as Sight & Sound’s recent survey of the greatest films of all time declared, one of the most important cinematic works ever created? Or is it, as Pauline Kael, who described it as “monumentally unimaginative”, and Rock Hudson – who surely spoke for a great many when he leapt to his feet at one early screening and demanded “Will somebody tell me what the hell this is about?” – believed, a baffling, over-long exercise in directorial hubris? How much of this was present in the original idea is an interesting question. Certainly when Kubrick wrote to Arthur C. Clarke in 1964 to float the idea of making “the proverbial ‘really good’ science fiction movie” the elements he suggested – the reasons for believing in the existence of extra-terrestrial life, the impact of such a discovery on human society and a space probe that lands on the Moon or Mars – give little hint of the cosmic grandeur of the final product. In his 1989 introduction to the novel, Clarke recalls the first meeting between the two fondly. Stanley was, he remembers, “basking in the success of … Dr Strangelove, and was looking for an even more ambitious theme. He wanted to make a movie about Man’s place in the universe,” a project, as Clarke observes, “likely to give a heart attack to any studio head of the old school, or, for that matter, of the new one”. The 36 year-old Kubrick and 47 year-old Clarke were a curious combination in many ways, yet in the months that followed they worked closely together, sketching out many of the elements of what would eventually become 2001. In so doing they drew upon several of Clarke’s stories, perhaps most notably his much-anthologised 1948 story, ‘The Sentinel’, which describes the discovery of an ancient alien monument on the Moon. In later years Clarke came to object to the widespread notion the film was “based on” ‘The Sentinel’, regarding it as a “gross over-simplification; the two bear much the same relationship as an acorn to an oak tree”. And while there’s little doubt the story anticipates the film in many ways, not least in its air of mystery, and of the transfiguring power of time’s immensity, it’s also clear Clarke and Kubrick borrowed freely from other works of Clarke’s, in particular the story ‘Expedition to Earth’, which formed the basis for the film’s opening sequence in ancient Africa, and his 1953 novel about the arrival on Earth of mysterious aliens, Childhood’s End. Yet there was also much that was new. Pleased by Kubrick’s insistence on technical accuracy, Clarke imagined a plausible mission to Jupiter (in the novel Discovery swings by Jupiter and continues on to Saturn, an idea Kubrick rejected for reasons of narrative clarity), as well as suggesting the presence of HAL (although it was Kubrick who suggested he be made an actual character, and that it be his breakdown that dooms Discovery’s mission). Nonetheless it is also clear the film was still relatively conventional and extremely literal, boasting not just lengthy voiceovers explaining the action and humanoid aliens but a prologue featuring interviews with prominent scientists, a fact that began to bother Kubrick more and more as the extended process of post-production continued. By April of 1966 he was concerned enough to write to Clarke about his concern they ran the risk of falling into “silly simplicity”. Even in its finished form the film is a curious mixture of the sublime and the banal. The strangely plastic textures of life in space, HAL’s soothing, almost hypnotic voice, even the repetitive nature of life on board the Discovery, all exist in a state of tension with the film’s great spaces of silence, its moments of terror. Indeed even the film’s most dramatic moments, in particular the moment in which HAL refuses to open the pod-bay doors to let Bowman re-enter (“I’m sorry, Dave. I’m afraid I can’t do that.”), are miracles of dramatic understatement, their significance undercut by the curious ordinariness of what is happening and the preternatural calm of Keir Dullea’s performance. Yet this tension is largely the result of Kubrick’s decision to reshape the film during post-production by removing explanatory elements and eliminating the voiceovers specified in the original script. Taken together these decisions allowed Kubrick to open the door to a radical reimagining not just of the film he and Clarke had created but of the possibilities of film more generally. Gone were the conventional narrative cues and explanations, in their place the audience were required to make what they could of the film’s silences and hypnotic rhythms. It is a decision underscored by the film’s use of music. 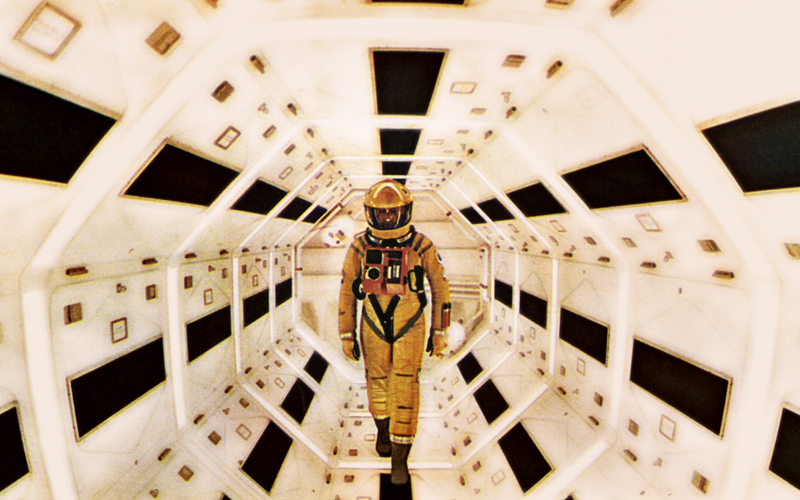 Although a score was composed by Alex North, Kubrick elected not to use it, deciding instead to retain the long sections of classical music he had used to assist in the editing. In so doing he denies the audience the emotional cues normally used to signal the meaning of what is being seen. As Roger Ebert has observed, this allows the music to exist “outside the action. It uplifts. It wants to be sublime; it brings a seriousness and transcendence to the visuals”. The effect, as more than one critic has observed, is to allow the film to act upon the audience in much the way the monolith acts upon the hominids in its opening section: as a source of hypnotic and – hopefully – transformative images. Imagined thus the film is not a narrative so much as a journey the viewer takes, an odyssey that arcs from the dawn of time to infinity and back again. This sense that the film is designed to alter our way of seeing is written deep into its fabric. Think of the hypnotic, unblinking red eye of HAL, the impassive gaze of the camera, the visions afforded to the hominids in the opening scenes and to Bowman as he tumbled into the monolith in its final sections. And, perhaps most significantly, the film’s final moment, when the creature Bowman has become, what Clarke’s novel calls “the Star-Child”, turns to meet the audience’s gaze, and the camera zooms in on its eye, suggesting that it has been here all along, and that it is ourselves. 45 years after its release 2001 is now a historical artefact. The anxieties that motivated it – Kubrick’s overwhelming horror at the possibility of nuclear war, the sense of imminent, transformative social and psychic change – are no longer so urgent; in their place we face the creeping horrors of environmental devastation. Likewise, even as the prospects of finding extra-terrestrial life of some simple sort have increased, the prospects of contact with extra-terrestrial intelligence have receded, leaving us with a sense that we are, perhaps forever, effectively alone in the universe. Even the eschatological fantasy that underpins it, the sense that history will, sometime soon, come to an end, has receded, supplanted by the eternal now of late consumer capitalism.Yet despite all this it remains as singular and improbable as the day it was released. Beautiful, strange, deliberately enigmatic, it is at once a vision of the infinite and a reminder of the possibilities of cinema more generally, a creation as mysterious and resistant to explanation as the monolith at its centre. The BFI volume on the film has some really interesting historical detail on how it was presented in cinemas during the initial theatrical run, framed as a unique cinematic experience. I’ve read some of the material about the way it was released, which is really interesting, both because of the way it undercuts the story about the movie being a commercial failure at the time of release, and because it’s a reminder of just how far the way we experience movies has shifted since the 1960s. Amused you’re interested by it as well: one of the things I became very aware of when I was reading about the film was just what a rabbit hole the 2001 trivia industry is; go down it and you may never come up again. Interesting to see how much Kubrick edited out; it’s a rare work that isn’t improved by cutting.